Every Right Riches For You™ class has a target to get the individual to become more aware of his or her current financial situation and to empower them to create personal changes. 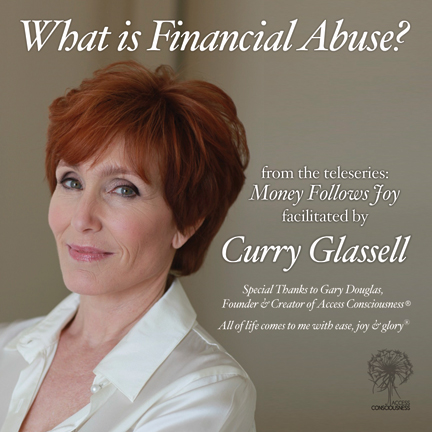 Curry Glassell is an Access Consciousness® facilitator, who facilitates many Access classes. She is most famous for facilitating Right Riches for You™. Right Riches For You™ is a speciality class of Access Consciousness® founded and created by Gary Douglas. In this class, you will be taught many tools and techniques which can change your point of view about money, wealth and riches. The Access Consciousness® point of view contends that your point of view creates your reality, not the reverse. Every Right Riches For You™ class has a target to get the individual to become more aware of his or her current financial situation and to empower them to create personal changes. These classes encourage all participants to ask questions and to practice using the tools daily. If used, these tools can create huge changes. The Right Riches For You™ tools are practical, pragmatic and easy to learn. These tools incorporate a “no nonsense” philosophy and attitude and can assist anyone with creating desired results. Born in New York and raised in one of the wealthiest homes in boomtown Houston, Curry Glassell became a struggling single mom without financial or emotional security, weighted down with a negative belief system that prevented her from manifesting her own success. When she discovered the principles of Access Consciousness® and changed her habitual way of thinking, the doors to abundance flew open. Today Curry is an acclaimed documentary filmmaker and global Access Consciousness ambassador who credits the program for her fabulous life of "ease, joy and glory."